Fly to Prague where, after passing through customs and immigration, you’ll be met by a Saga representative and transferred by coach to embark MS Johnannes Brahms. Enjoy a welcome reception and evening meal on board. You remain moored here in Prague overnight. Enjoy an included city sightseeing tour of Prague this morning. Prague has remained virtually unscathed by the great wars of the 20th century, so it’s blessed with an eclectic mix of buildings spanning the baroque, Gothic and neoclassical eras, right through to the modern-day. You’ll see the Charles Bridge lined with baroque statues, and in the Old Town Square admire the Town Hall with its famous astronomical clock, the Týn Cathedral and the mighty baroque Church of St Nicholas. After the Prague city tour you’ll spend the afternoon cruising towards Melnik, where you moor overnight. Leave Melnik before breakfast, and spend the morning cruising towards Decin, pausing briefly in Litomerice from where an optional excursion visits the Sandstone Mountains. The beautiful National Park of Saxon Switzerland, south-east of Dresden, is characterised by strange rock formations sculpted by erosion, sandstone cliffs, deep valleys and rugged gorges. The Elbe river winds it’s way through the mountains in a steep, narrow valley. Or, remain on board and continue cruising – your ship arrives in Decin later this afternoon. Spend the rest of the day exploring independently as you remain moored here overnight. Leave Decin early this morning for Bad Schandau. A highlight of today’s journey will be sailing around the beautiful gorge of Bohemian Gate. The ship continues to Dresden where you arrive this afternoon and remain moored overnight. This morning, look forward to an included excursion to infamous Colditz Castle. After the start of World War II, the castle was converted into a high security prisoner-of-war camp for Allied officers who had become escape risks and repeatedly broken out of other camps. The castle’s position on a rocky outcrop, above the River Mulde, made it the ideal ‘escape proof’ location. Despite this, there were many escape attempts. Of these, 120 men were recaptured but, by the end of the war, 31 had succeeded in getting home. You may remember the popular BBC drama series Colditz which aired between 1972 and 1974. Spend the afternoon in the town of Meissen, best known for its exquisite hand-made porcelain. Europe’s first white porcelain was produced in Dresden in 1708 meaning it no longer had to be imported from China at great expense. In 1710 the factory was moved to Meissen, where it was easier to protect the secret processes behind creating the worlds’ most expensive porcelain. On an optional guided tour of the Meissen Porcelain Manufactory, museum and a demonstration workshop you can witness the craftsmanship that goes into making pieces that are widely collected and exhibited in some of the world’s finest museums. Your ship remains moored in Meissen overnight. Your ship will leave Meissen in the early hours and cruise towards Wittenberg, arriving mid-afternoon. You may like to join an optional walking tour and discover Wittenberg’s UNESCO-listed town square with its charming, historic buildings, including the Castle Church, the Municipal Church where Martin Luther preached and the former monastery where he lived. On October 31, 1517, the Roman Catholic priest is supposed to have nailed his 95 Theses to the door of the Castle Church here. This is generally agreed to have started the Protestant Reformation, which rejected the total control of the Pope and corrupt practices of the Roman Catholic Church. You’ll also visit vast Market Square, which has bronze statues dedicated to Luther and his contemporary, Philipp Melanchthon – a great linguist and theologian. Your ship remains moored here overnight. Leave Wittenberg before breakfast, heading for Magdeburg, arriving mid-afternoon. Enjoy an afternoon at leisure.with time to explore one of the oldest cities in the former East Germany independently and discover some of its 1,200 years of history. Contrast the Gothic cathedral, completed in 1392, with the eccentric Green Citadel, one of the last architectural masterpieces designed by the artist Friedensreich Hundertwasser who died in 2000. It’s his rebellion against the straight lines and uniformity of many city buildings and the result is an intriguing curvy and decorative complex of apartments, public courtyards, shops, restaurants and cafes and a small hotel. And it’s not green it’s actually bright pink! Your ship remains moored here overnight. Depart Magdeburg early this morning and cruise on to Brandenburg. This state is an idyllic spot for nature lovers, with around one third of the landscape consisting of nature reserves. Explore the historic town centre this afternoon to discover medieval buildings and fine examples of German Brick Gothic architecture, including St Catherine’s Church and the Town Hall. Remain moored here overnight. After breakfast, enjoy an included walking tour of Potsdam. Transfer to Berlin and the locally rated 4-star Golden Tulip Berlin–Hotel Hamburg (4Q) for a two-night stay with dinner on the first night and breakfasts included. This centrally located hotel within Germany’s capital has a restaurant and a lounge bar where light meals and snacks are also available. All 190 air-conditioned rooms have a telephone, satellite television, radio, Wi-Fi and cable internet, safe, hairdryer and minibar (extra charge). From here it’s easy to go exploring independently to discover historic monuments such as the Charlottenburg Palace and an array of modern attractions, including museums, art galleries and shopping arcades. 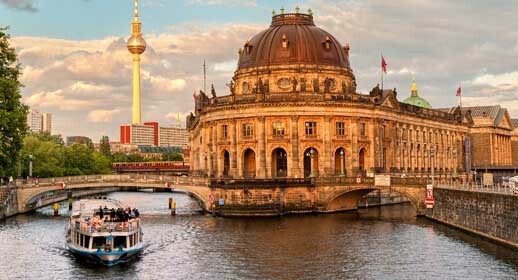 Stylish, chic and unashamedly bohemian, the avant-garde city of Berlin also has one of the most fascinating histories in Europe – learn more on an included city tour, taking in the iconic sights of Brandenburg Gate, Checkpoint Charlie and the Museum District. Then you have the rest of the day at leisure to explore further. You might like to look out for somewhere to eat tonight, at your own expense. Check out of your hotel after breakfast and transfer to the airport for your flight home.